Following the premiere of her new film, Vanessa Hudgens made her way back to the 'So You Think You Can Dance' set. The actress shared her look via her instagram page earlier today(August 7th). 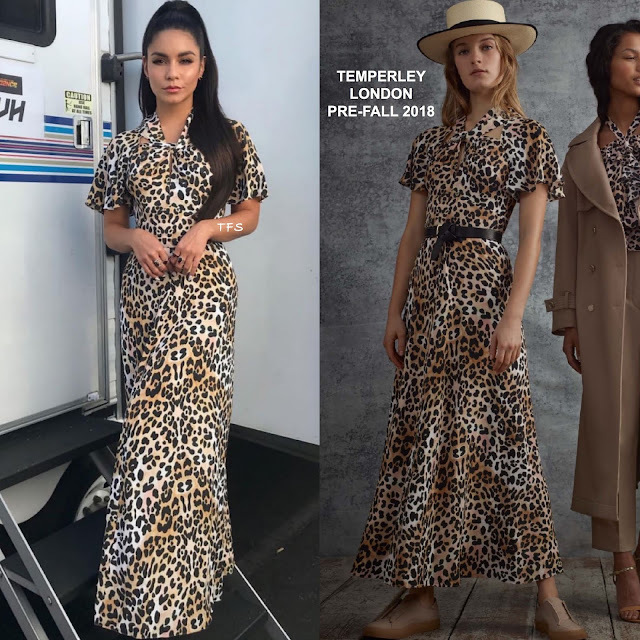 She posed for the gram wearing the TEMPERLEY LONDON PRE-FALL 2018 'Wild Cat' mixed leopard, flutter sleeve dress featuring a twisted, cutout neckline. In the look book, the dress was adorned with a belt which she left out and stopped just above the model's ankles. Accessorized with LE VIAN jewelry and GIUSEPPE ZANOTTI sandals, she finished up with a chic, high ponytail & pink lips. Are you feeling Vanessa's instagram style. You can get Vanessa's Temperley London dress SHOPBOP, MODA OPERANDI UK & NET-A-PORTER.